Connie Talbot, 8, and her second single “I Will Always Love You” has taken on the number 8 position on radio according to ACQB ratings. Recently the single has been holding the number 10 spot on the Billboards Hot 100 Singles Sales chart. The single “I Will Always Love You” which was written and sung by Dolly Parton in the early 70’s and which later became the best selling singles of all time in the early 90’s by Whitney Houston, comes from off of Connie Talbot’s debut album “Over The Rainbow” which was released in 2007. 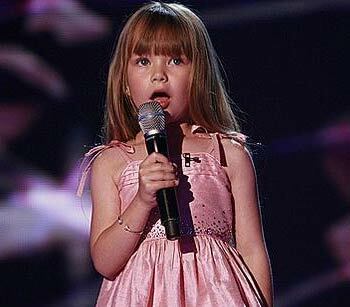 For those who do not know Connie Talbot, she made her presence known when she appeared on the U.K. talent show, Britain’s Got Talent at the age of six in which she become the a finalist (runner-up) after losing to 38 year-old Paul Potts. Since then, the 8 year-old singer has released two albums “Over the Rainbow” in 2007 and “Connie Talbot’s Christmas Album” in 2008. In related news, Connie Talbot is expected to be releasing a holiday album with hopes to be announced in August. In addition, the singer will be working on new material which is expected to release in 2010.